Mini tarts, mini tarts! Nothing is as cute as mini tarts! (Sorry for yelling; these tarts excite me greatly)! If you don’t have dozens of little tart pans in your kitchen, do not worry—just use mason jar lids! 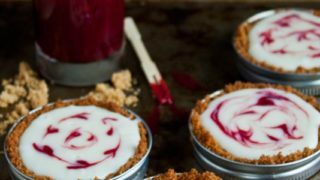 Y’all loved my mason jar lid pies, so I know you’ll love these mason jar tarts. I want to be the girl that brings mini tarts wherever she goes. I want a purse full of mini mason jar pies and tarts just like these. Let’s say you flub up parking in the city and you accidentally block someone in. Hand them a mini tart, and all is forgiven. How about another not-so-fictional situation: you accidentally lock you and your husband out of the house when it’s 34 degrees outside. Hand him a tart quickly! However,the tart is probably in your purse which is probably locked inside that same house. Yup. But we’re not going to dwell. We’re going to move passed this. You can use any type of chocolate for these tarts, just follow the ratio of ingredients: 1 cup of chocolate chips per two tarts. Scale it up to feed a crowd, or keep it simple and just serve two. I swirled the white chocolate with seedless raspberry jam, but you could use anything your little heart desires. Hint: the way to make the heart shapes is to put one drop of jam on the surface. Let it set for about 10 seconds, then drag a toothpick through the middle of the dot—viola! You could just swirl the toothpick around aimlessly for a less-than-perfect look. I’m currently living my life using the less-than-perfect look, so I’ll be the last to judge your messy tarts. To answer your question: yes!—they pop out of the rings easily because there is a decent amount of butter in the crust. To pop the tarts out, grip the mason jar ring with your fingers, and use your thumbs to gently push up. You may lose a few crumbs, but the crust should stay intact. I recommend a quick trip in the fridge to set the crust, but before serving, let the tarts return to room temperature. In a food processor, combine the graham crackers and sugar. Pulse for about 30 seconds, or until finely ground. Stream in the butter and continue mixing. The mixture should look like crumbs or wet sand, and it should slightly clump together when squeezed in your hand. if you over-mix, it turns into dough--not good. Place 4 mason jar rings on a small baking sheet. Place the lids with the rubber part facing down inside the rings. (The metal part is facing upwards). Divide the graham cracker crumbs between the mason jar lids. Use a shot glass to pack in the crumbs and push them up the sides of the ring. Use photo for guidance. Bake for 10 minutes. Let cool completely on a wire rack. Bring 1 cup of water to boil in a small saucepan. Make sure you have a glass bowl that fits over the pan without touching the water. Add the white chocolate and cream to the glass bowl, and have it ready next to the stove. Once the water boils, turn off the heat and add the bowl of chocolate and cream over the pan. Stir, stir, stir until the chocolate melts. You may have to turn the heat back on to boil the water again, but I find that if I'm patiently daydreaming while stirring the chocolate, it all melts just fine. Pour the white chocolate into the tart shells. Tap the lids gently to get rid of any air bubbles. Let sit for 10 minutes. Add jam drops on the surface of the chocolate, and after a few seconds, run a toothpick or knife through the chocolate to make a design. I recommend refrigerating the tarts for a few hours to set the chocolate. However, before serving, let them come back to room temperature---the chocolate is too hard when cold. The tarts will keep up to 2 days refrigerated. What a great idea! And so pretty too! THESE ARE SO PRETTYYY! Sorry. I was amazed by your mason jar pies back when you posted them, and have been meaning to make them ever since. Now with this reminder, I need to do some serious actioning. Yay! These are so pretty and so fun! Genius!! I love this idea..
Stop! These are so darn cute. These look simply amazing, and the idea of putting them in lids is simply inspired. I absolutely adore your mason jar lid treats! It is so creative and wonderful use of something so basic. These look so delicious too- I love those raspberry swirls!! These are seriously too cute Christina! Love this! Never buying mini tart pans, totally going to use mason jar lids. These are gorgeous little tarts! Love the raspberry swirl! THIS IS BRILLIANT. I love this idea of cute little tarts!!! I just cannot get over how adorable these are – I look at all our empty jar lids and VOW that I will be making some pies and tarts soon! Ok, first, you are hilarious. Your intro had me laughing out loud. But second, you are brilliant! 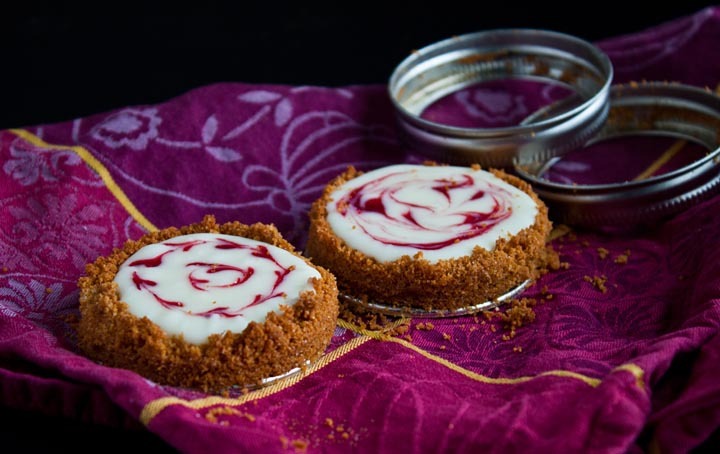 I’ve been wondering how to create mini tarts without actually buying a mini tart pan. Cannot wait to put this to use! Such a great idea! These are too cute! These look ridiculously good! Love how cute they are too!! Very cute! 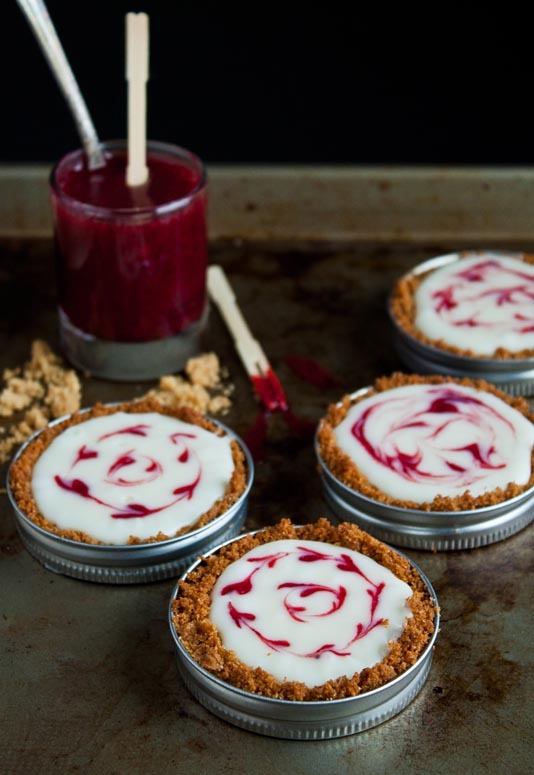 I love the idea of using mason jar lids as mini tart pans! wow! these look great!!! and great pictures! what a cute idea and these sound so yummy! How cool is this?! Very, very cool! What a great idea. I need mini tarts around all the time! Not that I eeeeever lock myself out of the house (cough) or do a bad parking job (cough cough). Oh YESSSSS PLEAAAASE. How cool that you can use Mason jar lids for mini tartlette pans? Loving it and your brilliance, miss thang. Also loving the flavors of these tarts! White chocolate and raspberry are meant to be together forevahhh. What a fab idea for an easy, scrumptious dessert for two! These are the cutest little things! Great idea to use the Mason Jar Lids. I’m going to steal that idea. I love that you made these in a lid and they are so pretty! Very cute. I have been working on my plating. Love the small portions. I officially love everything about these. The mini-ness…the tart-ness….the deliciousness…the cuteness. Ack! To locking yourself out! But having these tarts on hand would definitely make up for it. Actually…I feel like they could absolve pretty much any sin. These are adorable! Love the raspberry swirl! If you are going to be the girl who brings tarts everywhere, we need to hang out more often. Or just ever. This is such a brilliant idea! I will be doing some little tarts in Mason jar lids soon. 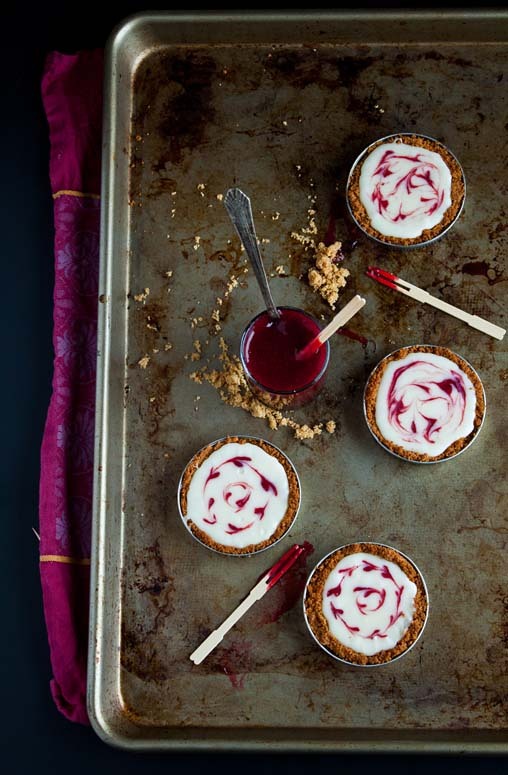 These tarts look delicious! Would these also be a good Valentine’s Day treat? These are the cutest! Love the combination of white chocolate and raspberries. First time at your site, I love your recipes and the really good pictures too! I saw these on pintrest a few days ago and (after pinning, of course!) was all like “YEEEEEEEES”. The rule. You rule. The end! Love the styling and the photo! They look delicious! These are just so precious!! These are the most creative and adorable things i have ever seen! They are so freakin cute and yummy looking! I have mason jars all over the place and this idea never even occurred to me! Consider my mind blown!! This tarts are darn cute! They look very tempting! I’m positively floored by your ingenuity here! I would never have dreamed of re-purposing jar lids as tart molds. So, so smart, and definitely an idea I’ll have to steal in the future. ;) Seriously inspired now! If you start walking around your new city with a purse full of these mini tarts you will make friends SO fast. These are so creative! Love them. I love these…super adorable and just in time for valentines day! This looks easy and gorgeous and you’re a genius. I’m wondering how much graham crumbs that is in US cups? I tend to buy them pre-ground and would still love to be able to make these. Thanks! I adore these! I’ll be featuring on my Mason Jar Crafts Love blog tomorrow. Just one photo, quick overview (no recipes are given) and a clear link back to you! Hope that’s okay with you! These are gorgeous. Loving how you’ve served them in mason jar lids! too cute. Can these type tarts be made and frozen for perhaps a week or two? Sure, Karen! I don’t see why not. Just stumbled on your website, and I’m already a big fan! My hubby loves all things mason jars, so this is the perfect dessert for us! Thank you! Do you think theses could be made and frozen? Thinking of favors for daughters wedding??? Thank you! WOW! Would SOMEONE please make a dessert BEFORE commenting! I’d like to know the measured amount of the graham crackers, since my husband doesn’t like grahams & I will be using another cracker…. then , when I’ve done them I’ll give a comment/review. thanks! I’ve loved this idea for a long time and tried it for the first time at Christmas. Unfortunately I couldn’t get the graham tracker crust out of the ring. Pushed from the bottom and the crust just crumbled. What did I do wrong?